(PNS) The Presbyterian Historical Society has announced seven Heritage Preservation Grants to PC(USA) congregations in 2019. Anderson Presbyterian Church (Jackson, Tenn.), organized in 1893. First Presbyterian Church (Sylvan Grove, Kan.), organized in 1876. West Adirondack Presbyterian Church (Star Lake, N.Y.), successor to churches organized in 1897 and 1903. First Presbyterian Church (Luling, Tex. ), organized in 1877. 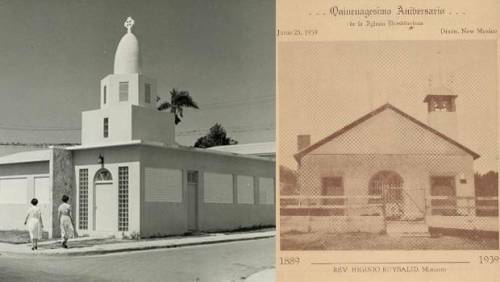 Iglesia Presbiteriana en Rincón (Rincón, P.R. ), organized in 1908. Embudo Presbyterian Church (Dixon, N.M.), organized in 1889. Midway First Presbyterian Church (Midway, Ga.), organized in 1868. The Heritage Preservation Grants program was established in 2001, PHS’s 150th anniversary. Sustained this year by donations to the PHS annual fund, each in-kind grant of $500 will cover much of the cost of digitizing a congregation’s vital records, including session minutes and church registers. As ever, we thank all congregations that took the time to prepare an application. With 28 applicants, this was a banner year, according to a PHS news release. Congregations older than 50 years with fewer than 250 members can apply for the next grant cycle. The deadline every year is Oct. 31. You can help support this vital program by making an online contribution here. You may also mail your payment to Development Department, Presbyterian Historical Society, 425 Lombard Street, Philadelphia, PA 19147.